Wildlife Art - Interview with Chris McClelland Aug 26, 2014 At ADL we’re always keen to talk to individuals out there in the world engaged in the subject matter our courses teach. With our recent focus ..
Re-embrace Your Dreams! Mar 28, 2016 We all had dreams when we were small about what we wanted to be when we grew up. Some of us looked to our sporting idols and dreamt we could be like t..
Good morning ,Please may I kindly be assisted on how best can I study with you from Zimbabwe.Also I see you are quoting your prices in British pounds and in my country we only use USD how do I make my payments.Lastly I would like to understand how your courses compare internationally and how long do they take. Our courses can be studied from anywhere in the world as they are all delivered via our online student zone. You can also pay extra for a paper version of your course to be sent to you. Payments can be made in USD. One course is $530.00. This course is accredited by the IARC, an international accredidation body and our qualifications are recognised worldwide. The course takes roughly 100 hours of self paced study to complete. You may complete these 100 hours as quickly or as slowly as you need. But to give you a time frame, if you stuck to a disciplined schedule of 10 hours of study a week, you would spend about 2.5 months completing the course. ( 11/10/2013 ) A: Hello Holly, The accrediting body for these courses is the IARC. You can copy/paste this link: http://www.iarcedu.com/default.aspx to find out more about them. As our short courses are not part of the national frame work, so I'm afraid they would not give you UCAS points on completion. ADL's online Wildlife Conservation course will provide you with the foundation knowledge of conserving threatened wildlife. The content of this 100 hour module is an excellent choice both as a general interest course and as a stepping stone into the field of wildlife conservation. The Role of Protected Areas a levels of protection, approaches to reserve selection and limitation of reserves. Plant Identification common names, scientific names, levels of division, botanical keys. Managing Threatened Wildlife Populations â?? manipulating populations, revegetation/restoration, creating corridors, pest control plans, fencing for species, fire breaks. Our Wildlife Conservation course will provide you with the foundation knowledge of the guiding principles fcr serving threatened wildlife. Gain all important hands-on experience with wildlife animals, to add to your CV whilst you are studying your wildlife conservation or management course with ADL, or after completing it. We are very happy to be associated with GVE, which offers an unforgettable volunteer experience in South Africa with their Game Capture and Vet Experience programs. 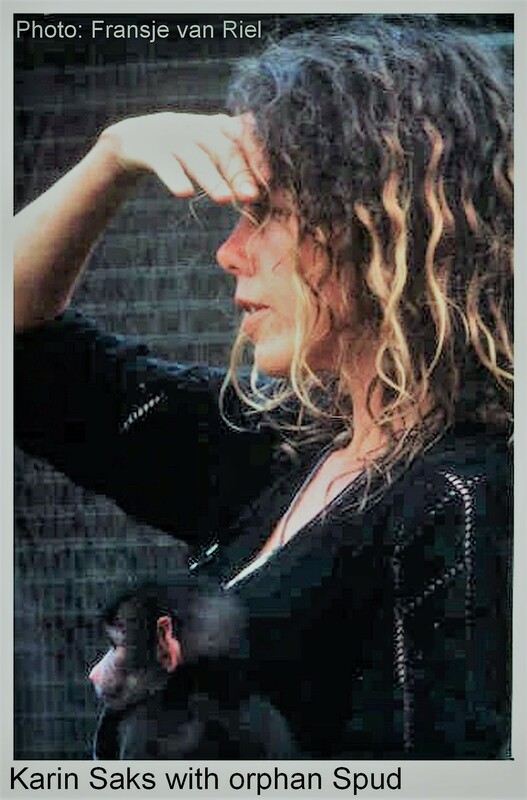 Since 1997, Karin Saks has been involved in the fostering and rehabilitation of orphan baboons, the caring of injured monkeys who have been returned to the wild and has worked towards a harmonious co-existence between these primates and humans. She has monitored wild baboon troops who raid human homes to research ways of baboon management and has observed wild troops in her area with a view to finding out damage done to troop structures and numbers because of human intervention. Due to legislation that allows for the persecution of vervet monkeys and baboons in South Africa, hundreds of orphaned primates currently reside in rehabilitation centres without much chance of being released back into the wild. The primate pet trade is also on the increase due to the amount of infants orphaned when mothers are killed. Educating the public on how to live harmoniously with these primates and appealing for new protective legislation - that is actively enforced - are crucial aspects to finding solutions. His artwork captures the movement of wildlife that is so captivating with a skill and precision that make his animals come alive. Chris and his wife Maggie (a respected and accomplished photographer in her own right), held an exhibition recently of their work in Canterbury. Please read the article on our Blog titled Wildlife Art to find out more about this outstanding artist and his love for all things wildlife.